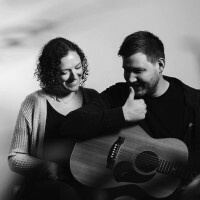 Michael & Becci Ball are a husband and wife duo who have just had their first album 'Holy One' released. Produced by Jonathan Ogden (Rivers & Robots), it's already receiving plenty of plaudits. Cross Rhythms caught up with the couple from Manchester and threw a batch of questions at them. Tony: Tell me a bit about the recording of 'Holy One'. Michael: This project started life as a solo project. I was looking to maybe record a handful of songs and release an EP. But during the songwriting process and as we started laying some tracks down, it became clear that this was a project that we were going to do together and that it was going to be more than just a few tracks! We recorded the whole project really low-fi. We set up a fold away table in the lounge and used my laptop and that was our recording studio. We'd asked our friend Jonathan Ogden to help with the project, so he sort of fell into the producer role really which was super helpful since the first few Rivers & Robots recordings were just him with his laptop in his bedroom! We recorded the whole thing in our spare time, whenever we could get a day together the three of us and it took us about five months in total to record. Then after a little delay we mixed and mastered it together. For us, it was really nice that the project was entirely in-house (literally in our house!) as it meant there was no real deadline looming over us, we weren't spending huge amounts on studio hire, so we could really take our time to find what sound we were going after. Tony: Tell me about some of the songs on the project. Michael: The opener "Who Is Like You" is a favourite. We only sing those words once on the bridge. One of the few regrets we have of the album is that we didn't do a repeat of it! At its core, it's a song of being awe struck at the magnitude of who God is and yet despite that, he sees us and cares about us. When we hit the bridge we get to declare together that even though things around us seem like chaos at times God is always in control and we can always cling to him, to his faithfulness and his goodness. It was one of the early songs written for the project and was really electronic and stripped back, with an 808 and pads. When Jonathan got involved the whole thing became way more natural and that really set the tone for the whole project. The chorus for "Holy One" actually came in its entirety as a spontaneous song at the very start of a set I was leading in the prayer room back in 2013 and we've been singing it since. The rest of the songs we wrote together and for us it really captures the heart of who we are and what we do, it's a song that is fully focused on the one seated upon the throne. It's our life priority to minister to the heart of God, to sit before him and gaze upon his beauty. We hope that it will help lead people into the presence of God and give language to their encounter. "All Because Of You" is one of the more poetic tracks on the album. When we decided that it would become a joint album Becci wanted there to be a couple of tracks that were hers, so she wrote this one on her own. It went through several versions and was probably the last track we finished for the album. The lyrics actually sum up the main theme of the whole album. It was written in a really challenging season of life but despite all that was going on God was always there, always lifting our heads and it was reminding us that it was all about him. Tony: Can you both give us some background information about yourselves? Michael: I grew up in Bolton, my parents are Christians and we went to a local CofE church. My folks were always really involved in church so church played a large part of my childhood. And I guess I always had head conviction that God was real and slowly during my early teen years he began to become more real to me but I don't think I had any significant encounters with God until I met Becci and started going to her parents Vineyard church. I began to learn about the Holy Spirit in a personal way and seeing the prophetic in action and my faith started to come alive, but at the same time I was playing drums in a secular metal band so my life began to become quite torn, one minute I was at youth life group praying and prophesying with friends, the next I was playing drums in bars and clubs not making particularly Godly decisions. Anyway, long story short, I had an encounter for the first time in my life where the Lord spoke to me and told me that I was to go to uni in Carlisle and that day I quit the band and the rest is history! Becci: My parents are church leaders so I grew up in church and have been around the 'business' of church my whole life. We lived in Bolton until I was three, moved to Cambridge for a few years, spent six months in Colorado and then moved back to Bolton when I was seven when my parents planted Manchester Vineyard (now Vinelife). I don't have a single memory that I consider the moment I became a Christian, it's always been a reality for me, but growing up right in the middle of church life meant I got to meet some incredible people and have them pray for me and speak into my life. Tony: How did you meet, fall in love and marry? Becci: We technically met when we were babies as my dad was the curate at the church Michael's parents went to, but we didn't really meet until we were at 6th form together. We had some mutual friends and got to know each other through them. I think we knew at 17/18 that we were going to get married but it's young and awkward so we waited until we were 20/21, in our final year of uni to get married which was actually really great. We got to figure out how to live together and do life together in the uni bubble of no real responsibilities. Tony: I understand you've been leading worship since 2002. Were there always original songs in your repertoire? Michael: We always liked the idea of writing our own material but never seemed to get anywhere when we tried. It wasn't until we started the House Of Prayer in 2010 that we began to embrace more spontaneous singing which we found to be the best place to start songwriting! As we began to immerse ourselves into singing the word (which is the lifeblood of the House Of Prayer) we began to get biblical content in our hearts, we found we actually had something to say in our songwriting. Tony: What inspired you to go ahead and record an album? Michael: The House Of Prayer is a very musical place. Every prayer meeting we hold has musical worship throughout and so we sing and play a lot of songs. It was in that context that we started writing and we'd always liked the idea of recording some songs. We then found ourselves in a really challenging season of life and songwriting became our escape and so it felt like a now or never moment, so we went for it! Tony: I understand you had a rather convoluted situation in getting the album released. Can you explain it, please? Michael: We finished recording in January 2018 and released our first single then too. But Jonathan was mixing in his spare time, which he didn't have a lot of since he was signing a record deal and then writing, recording, releasing and touring an album with Rivers & Robots! So it wasn't until October 2018 that we could finally make time together to finish the mixing. We then began the process to self-release the album for mid-December. Part of that process was getting in touch with various people from Christian press, playlist curators and such and I sent a speculative email to Furnace Music, a label based out of a House Of Prayer in Fredericksburg, Virginia. This began a conversation about how we could move forward together. They told us they had just signed a distribution deal with Integrity Music and in the end we signed with Furnace, but it meant further delaying the release! But finally, it came out on the 15th February! Tony: What has been a particular highlight in your ministry so far? Michael: We took a team out to Rio de Janeiro during the 2016 Olympics to help lead sets in the prayer room there and then do street ministry in the red light district each night. It was one of the most intense weeks of our lives! There was our team and a few other teams from the US and we were staying in a church building, sleeping on mattresses on the floor. During the day we were in the prayer room facilitating six hours of worship and prayer and then each evening we were out on the street ministering to prostitutes in the red light districts around the city. The days were really long and the evenings of ministry quite challenging and emotional and spiritually draining so our time in the prayer room each day became our recovery time and fuel for the next evening. And it was so beautiful to worship with the staff and team at the House Of Prayer there. The chorus for our song "In Every Season" was actually a spontaneous chorus from one of our sets whilst we were there.